The Willows, in Hainault, Ilford, has been nominated as Britain’s best banqueting suite for Asian weddings. The venue scooped two awards at the British Asian Wedding Awards 2018, including the best banqueting suite in Britain for Asian Weddings and the best suite in the south east of England. The award was given after couples who held wedding celebrations at the Willows picked the venue through an online ratings system. The Willows hosts approximately 200 events per year, many of which are Asian weddings. The venue is named after the three willow trees which stand in the extensive grounds. It is also known for an opulent ballroom which accommodates up to 1000 people, it’s convenient location, state-of-the-art audio-visual system, crystal chandeliers, 250 car parking spaces and magnificent water fountain. Julio Marques, Operations Manager of The Willows and the nearby Holiday Inn Express Newbury Park, said: “These two awards are a fantastic recognition of what has been achieved by the team’s hard work and the company’s investment since 2014 to make the Willows the spectacular venue it is now. “While the majority of our celebrating families are from the borough of Redbridge and surrounding areas, such is our reputation that clients come to us from as far as Birmingham, Leicester and Manchester. We’ve even had one family from Israel! Nadim Anwar, from Leyton, whose daughter got married at The Willows, said: “We looked at a couple of wedding venues before someone recommended The Willows. 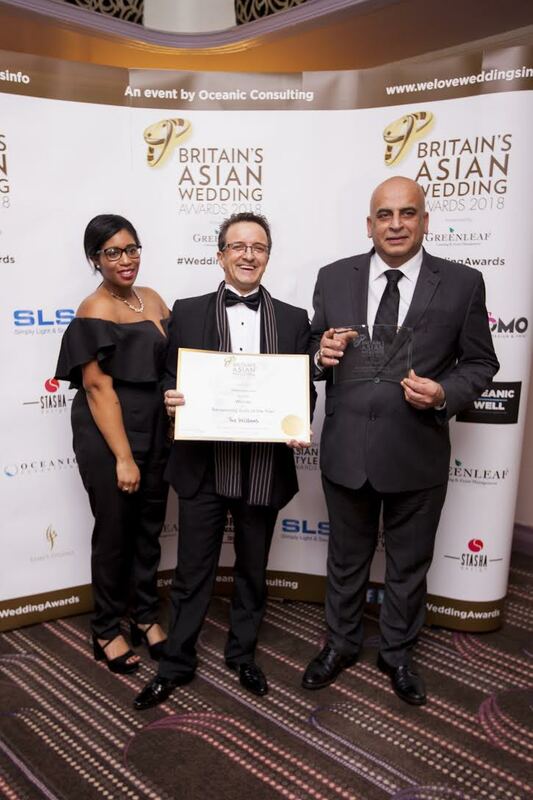 The Willows received its awards, which celebrate Britain’s expanding Asian wedding industry and recognise those who go “above and beyond” for couples, during a ceremony on 18th February 2018 at the Sheraton Park Lane Hotel in London.